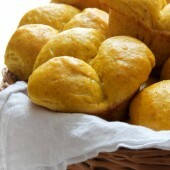 Fluffy homemade clover dinner rolls with a seasonal pumpkin twist, perfect for Thanksgiving and Fall gatherings! Heat milk to 115°F. Mix in honey and yeast. Allow to proof for 5-10 minutes. If it doesn't foam up, start again. Prepare stand mixer with dough hook attachment. Mix together flour, salt, spices, pumpkin, egg, butter and yeast mixture together until dough pulls away from the sides of the bowl. Transfer dough to a large greased bowl. Cover with plastic wrap and allow to rise for at least 1 hour or doubled in size. Grease a muffin tin well. Cut dough in half. Shape one half into a 12-inch rope. Divide into 6 pieces and then each piece into thirds. Roll thirds into balls. Place three dough balls per greased muffin tin cavity. Repeat with remaining dough. Cover loosely with a clean towel. Allow to rise an additional 30 minutes. Beat together 1 egg and 1 Tbsp water. Brush over rolls. Bake for 20 minutes or until centers reach at least 200°F. Cool in pan before removing to a wire rack or basket.